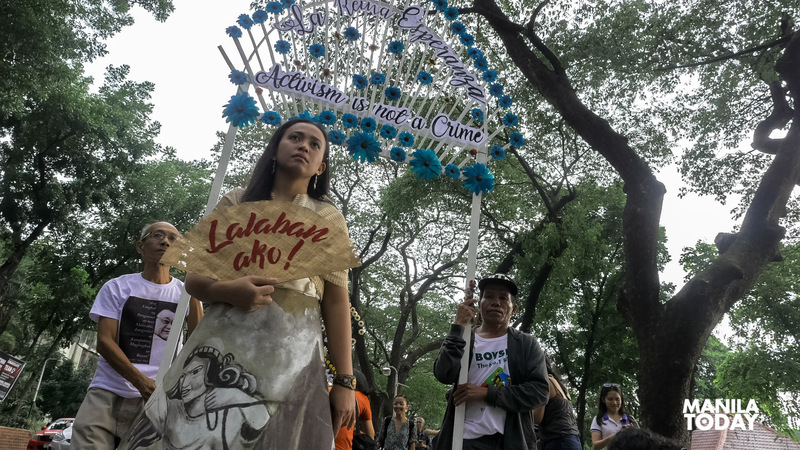 Intermittent rains didn’t stop human rights groups from holding an alternative form of protest dubbed ‘Protesta De Mayo Laban sa Tiraniya’ at the University of the Philippines Diliman today. 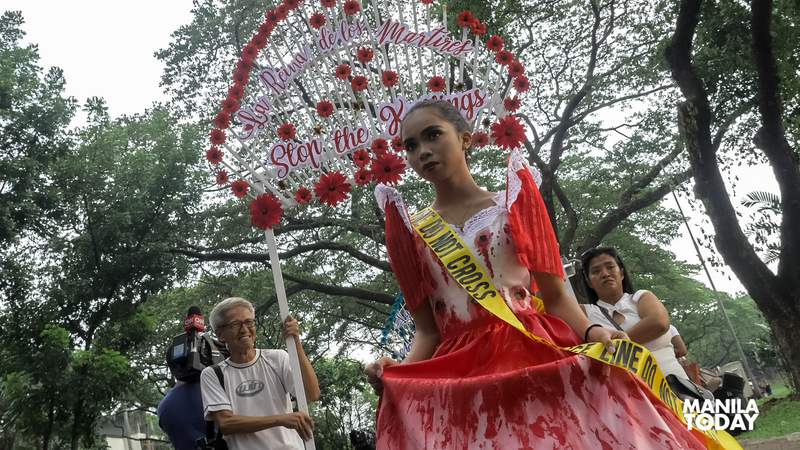 Organized by Karapatan and Hustisya, the ‘procession’ of five ‘reinas’ depicted current human rights issues and people’s stuggles under the Duterte administration. 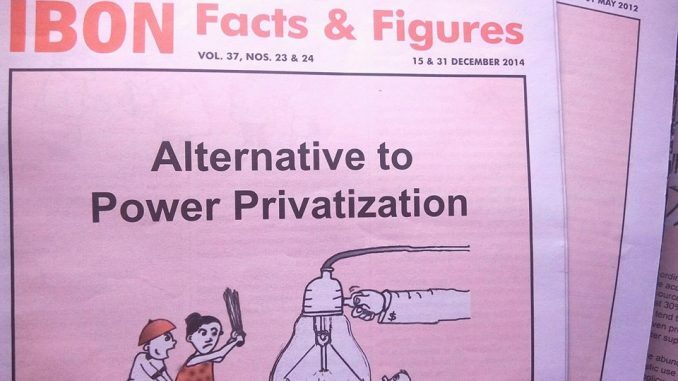 La Reina de la Verdad shows the curtailment of press freedom by the government and the growing resistance of artists and media practitioners. La Reina de los Martires is Deborah Escudero, sister of drug war victim Ephraim Escudero. Escudero was abducted by unknown men in San Pedro Laguna in September last year. He was found dead in Pampanga five days later. On La Reina Esperanza’s skirt is Filipina revolutionary leader Gabriela Silang. 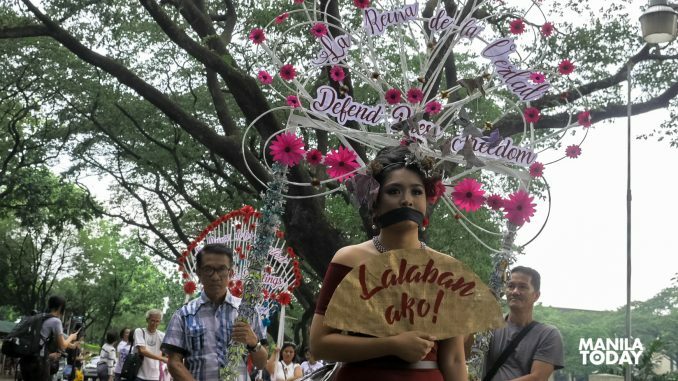 Her ensemble protests the Duterte government’s terror tag against activists, human rights defenders, development workers, and church people. La Reina de la Paz. Her piece illustrates the people’s struggles under martial law in Mindanao. 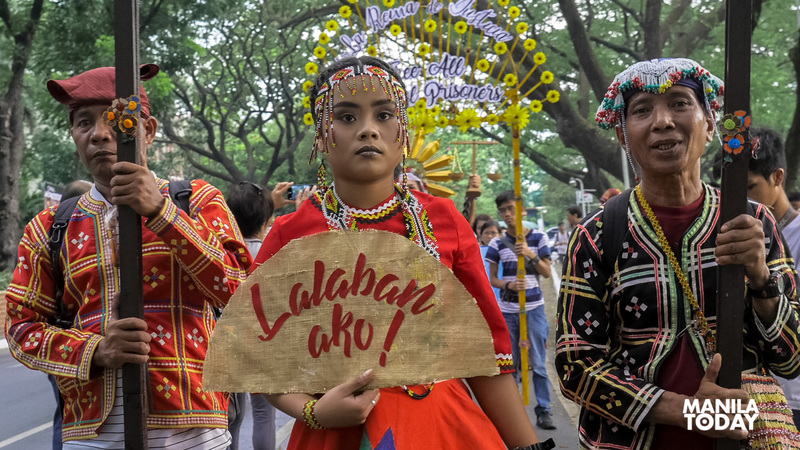 Documented human rights violations since Duterte declared martial law last year include 49 extrajudicial killings of Lumad, peasants, and Moro and the displacement of 500,000 civilians due to military operations in the countryside and in Marawi City. The procession’s Reyna Elena is Eleanor de Guzman as La Reina de la Justicia. 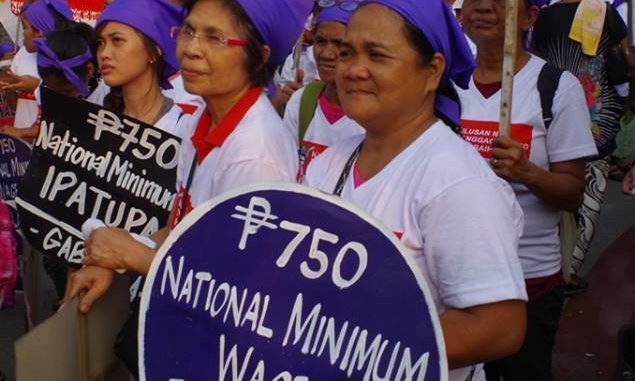 De Guzman is the daughter of National Democratic Front (NDF) peace consultant Rafael Baylosis and wife of trade union organizer Marklen Maoj Maga. Both Baylosis and Maga were detained on January and February this year, respectively, on trumped-up charges. 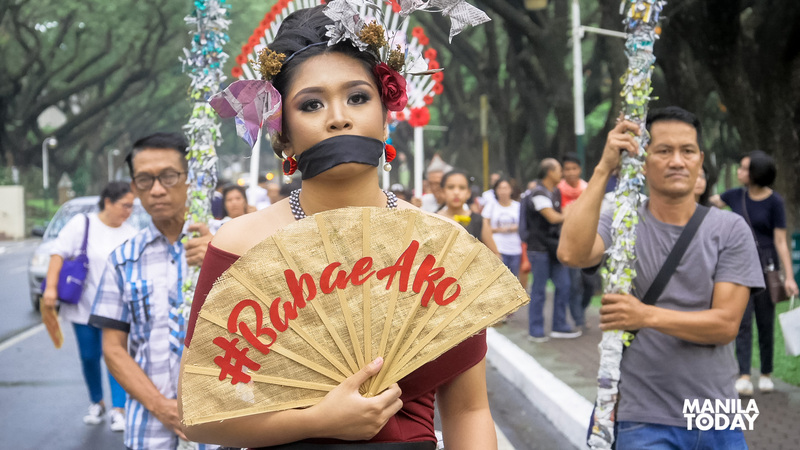 The Flores de Mayo spin-off is also Karapatan’s contribution to the #BabaeAko #LalabanAko campaign. This movement of women posting the said hashtags on social media networks is a response to Pres. Duterte’s sexism and misogyny and came soon after the president’s snide remarks about not appointing a woman as the next chief justice. 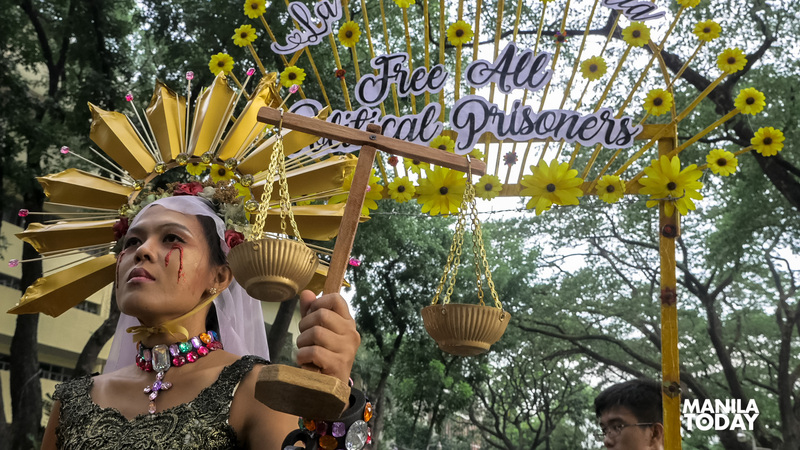 The post IN PHOTOS: Rights groups stage ‘Protesta De Mayo’ appeared first on Manila Today.